Found and resolved this issue. Will take a day or two to propagate. I'm assuming this will include disc ID support for triple layer discs? Add DVDs to Collection By Inserted Disc does not even work with Blu-ray discs. doesn't really work with DVD disc id either - only gives you the option of BR/DVD combo and not the stand alone when the disc id's are the same. How do we know when the beta is available for download? Will it be announced in this thread? I would think this would be announced in the announcements forum? Followed by a new thread in the Desktop Beta Release Testing forum? I believe there is also something triggered to let you know in the program itself as well. Half way through the new month Ken... how about another teaser at least. If a screen cap won't do it justice maybe a mini coming soon list or something? The new version will make a great Christmas gift! Shall we see that in new version ? Too bad Christmas isn't on a Monday this year. Well, it will be next year. So whatcha say Ken? The "next" month is over in just a couple days... where is our beta release? Note the new options to skip unchanged. 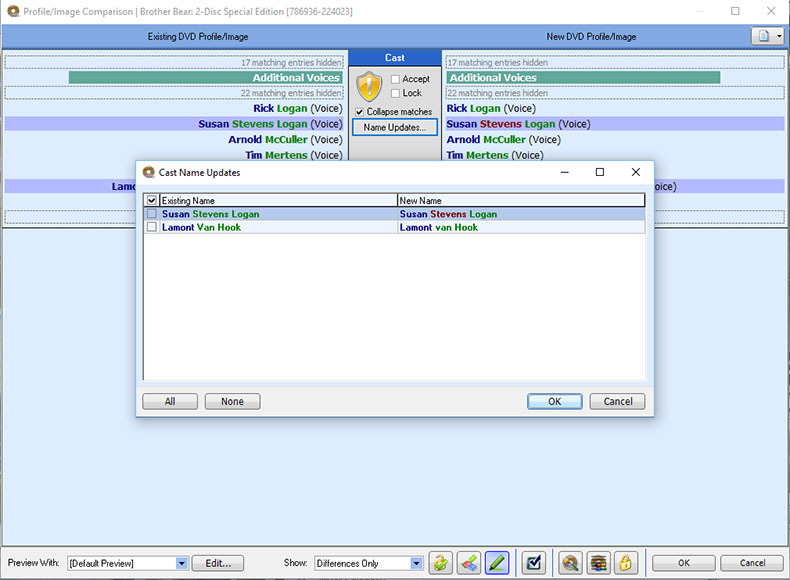 Although this was partially possible via right-click in prior releases, the new version analyzes the update against your local database and determines which changes will not apply. Optionally, changes in locked sections are ignored in the comparison. 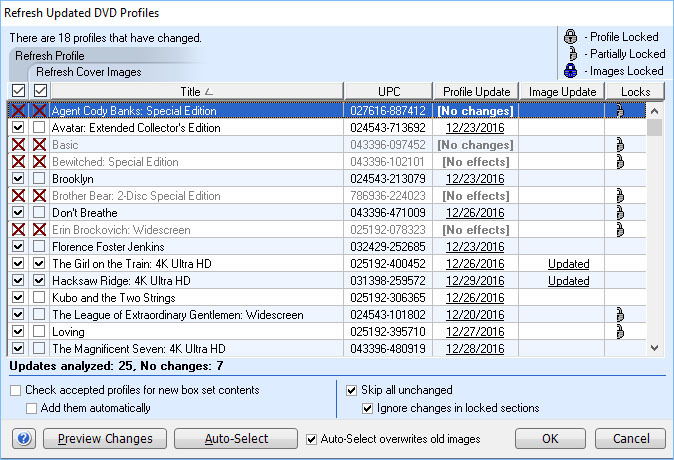 Additionally, this feature considers data which respect the local database choice (such as box set contents and cast/crew name capitalization). For profiles with no changes at all, 'No changes' is displayed. For profiles with changes that will not be applied due to your preferences, 'No effects' is displayed. If the checkbox is selected, the program will skip these updates. If you elect to view these changes, you can also choose to specifically accept the name changes on a case-by-case basis. Note also the option at the bottom, Show: Differences Only. An additional choice is available here to show Effective Changes only. So for example the cast differences shown here would not be shown. Cool... anther nice update! I like this one! Here is hoping supper is not too late. It is never good to keep a fat man waiting for food! This will certainly help in keeping all of the stuff I don't like, that is in the online DB, from polluting my local.